1. 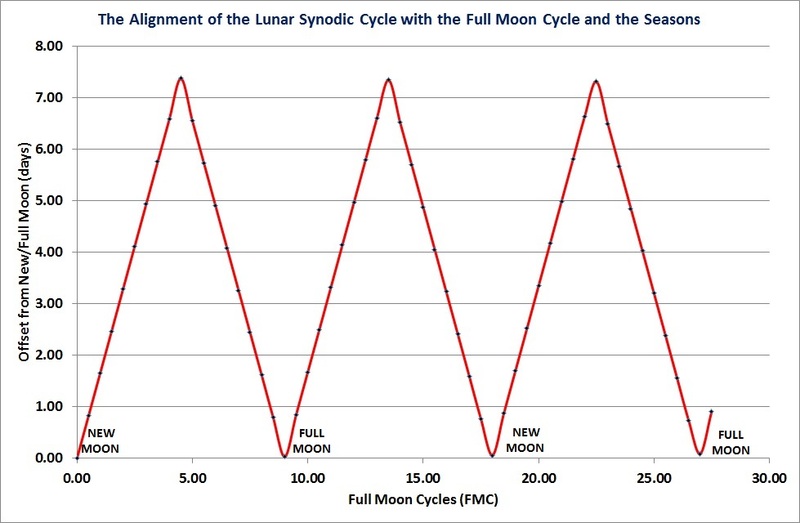 The Synodic (phase) cycle of the Moon precisely re-synchronises with the times of the Extreme Perigean Spring tides (EPST) once every 574.60 topical years. 2. Jupiter precisely re-synchronises itself in a frame of reference that is rotating with the Earth-Venus-Sun line once every 575.52 tropical years. 3. The orientation of Jupiter to the Earth-Venus-Sun line produce the tidal torques that act upon the base of the convective layers of the Sun which are thought to be responsible for the periodic changes in the level of magnetic activity on the surface of the Sun (i.e. 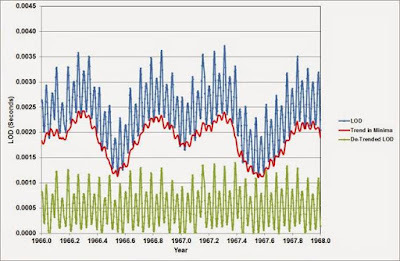 the Solar Cycle). 4. 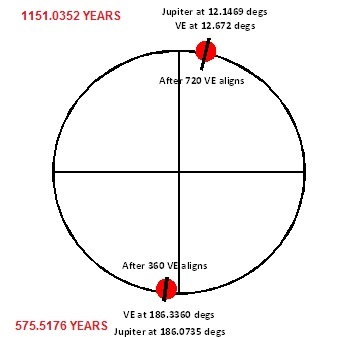 The period of time required for Jupiter to precisely re-align with the Earth-Venus-Sun line in a reference frame that is fixed with respect to the stars is 4 x 575.52 = 2302 years. This is the Hallstatt cycle that is intimately associated with the planetary configurations that are driving the VEJ Tidal-Torquing model for solar activity. 5. 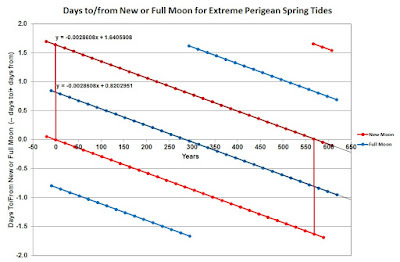 Hence, the repetition period for strongest of the Extreme Perigean Spring tides appears to match that of the planetary tidal-torquing forces that are thought to be responsible for driving the Solar sunspot cycle. 6. The Venus–Earth–Jupiter (VEJ) tidal-torquing model is based on the idea that the planet that applies the dominant gravitational force upon the outer convective layers of the Sun is Jupiter, and after Jupiter, the planets that apply the dominant tidal forces upon the outer convective layers of the Sun are Venus and the Earth. Periodic alignments of Venus and the Earth on the same or opposite sides of the Sun, once every 0.7993 sidereal Earth years, produce temporary tidal bulges on the opposite sides of the Sun’s surface. Whenever these temporary tidal bulges occur, Jupiter’s gravitational force tugs upon the tidally induced asymmetries and either slows down or speeds-up the rotation rate of plasma near the base of the convective layers of the Sun. The VEJ tidal-torquing model proposes that it is the variations in the rotation rate of the plasma in Sun’s lower convective layer, produced by the torque applied by Jupiter upon the periodic Venus–Earth (VE) tidal bulges that modulate the Babcock–Leighton solar dynamo. 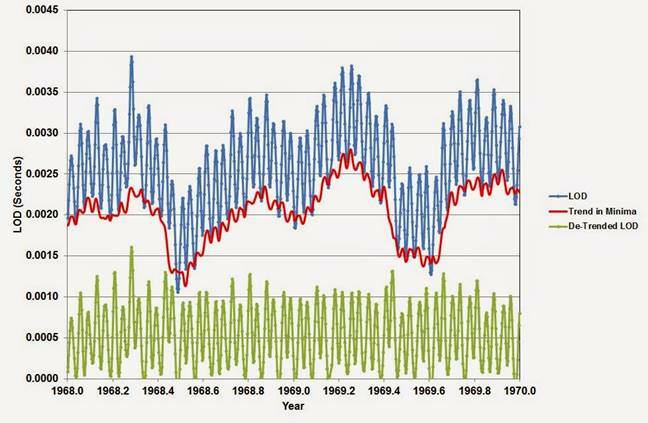 Hence, the model asserts that it is the modulating eﬀects of the planetary tidal-torquing that are primarily responsible for the observed long-term changes in the overall level of solar activity. What makes this simple VEJ tidal-torquing model so intriguing is the time period over which the Jupiter’s gravitational force speeds up and slows down the rotation rate of the Sun’s outer layers. 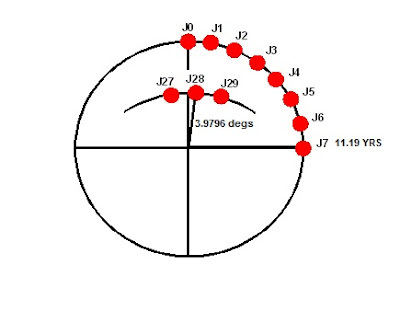 Jupiter’s movement of 13.00 deg. per 1.5987 yr with respect to closest tidal bulge means that Jupiter will increase the rotation speed of the lower layers of the Sun's convective zone for 11.07 yrs. This is almost the same amount of time as to average length of the Schwabe sunspot cycle (11.1 ± 1.2 yrs, Wilson, 2011). In addition, for the next 11.07 yrs, Jupiter will start to lag behind the closest tidal bulge by 13.00 deg. every 1.5987 yrs, and so its gravitational force will pull on the tidal bulges in such a way as to slow down the rotation rate of the outer convective layers of the Sun. Hence, the basic unit of change in the Sun’s rotation rate (i.e. an increase followed by a decrease in rotation rate) is 2 × 11.07 = 22.14 yrs. This is essentially equal to the mean length of the Hale magnetic sunspot cycle of the Sun, which is 22.1 ± 2.0 yrs (Wilson, 2011). It is important to note that, the actual torques that are applied by Jupiter to the temporary tidal bulges induced by alignments of Venus and the Earth, vary in-phase with the observed 11 year sunspot cycle. 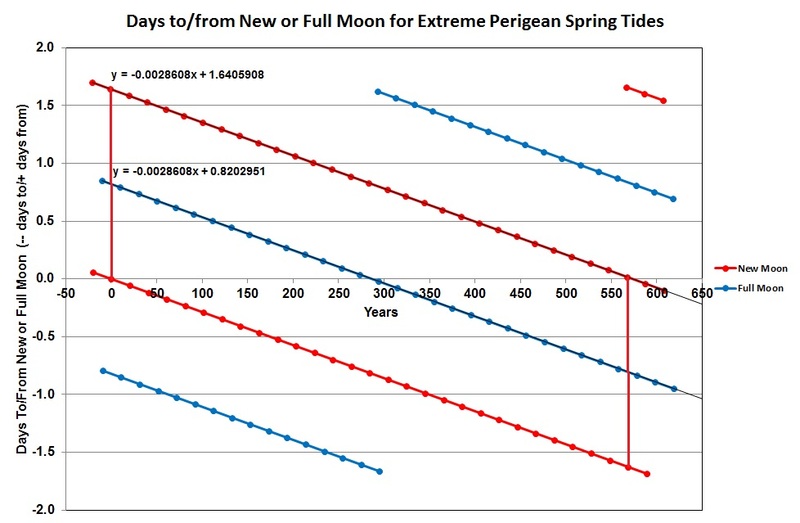 Extreme Perigean Spring tides (EPST) occur when a New moon occurs at time when the Perigee of the lunar orbit points directly at the Sun or when a Full Moon occurs when the Perigee of the lunar orbit points directly away from the Sun (the latter are often called Extreme Super Moons). Figure 1 shows a schematic diagram an EPST occurring at a New Moon. EPST at New Moon re-occur once every 18 Full Moon Cycles (FMC) = 20.2937 tropical years (where one tropical year = 365.242189 days). Figure 2, below, has as its initial starting point (T = 0.0 tropical years), a New Moon taking place at the precise time that the Perigee of the lunar orbit points directly at the Sun. In addition, this figure shows the number of days to (negative values on the y-axis) or from (positive values on the y-axis) a New/Full Moon for each of the EPST's that occur over the next 618.4 tropical years. Figure 2 shows that the point representing the New Moon at T = 0.0 tropical years is part of a triplet of points with the other two points occurring at (-1.1274 tropical years, 1.64 days) and (+1.1274 tropical years, -1.64 days). Hence, a point starting at (-1.1274 tropical years, 1.64 days), reaches the x-axis at (573.4727 topical years, 0.0 days), leading to an overall repetition cycle of 574.600 tropical years. "The Venus–Earth–Jupiter (VEJ) tidal-torquing model is based on the idea that the planet that applies the dominant gravitational force upon the outer convective layers of the Sun is Jupiter, and after Jupiter, the planets that apply the dominant tidal forces upon the outer convective layers of the Sun are Venus and the Earth. 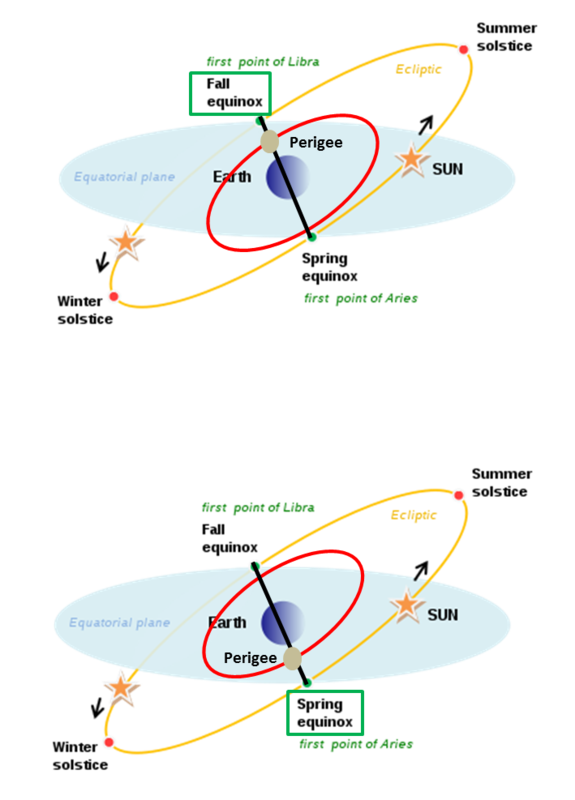 Periodic alignments of Venus and the Earth on the same or opposite sides of the Sun, once every 0.7993 sidereal Earth years, produces temporary tidal bulges on the opposite sides of the Sun’s surface (Fig. 3 – red ellipse). Whenever these temporary tidal bulges occur, Jupiter’s gravitational force tugs upon the tidally induced asymmetries and either slows down or speeds-up the rotation rate of plasma near the base of the convective layers of the Sun. 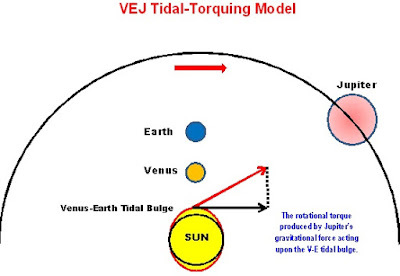 The VEJ tidal-torquing model proposes that it is the variations in the rotation rate of the plasma in Sun’s lower convective layer, produced by the torque applied by Jupiter upon the periodic Venus–Earth (VE) tidal bulges that modulate the Babcock–Leighton solar dynamo. 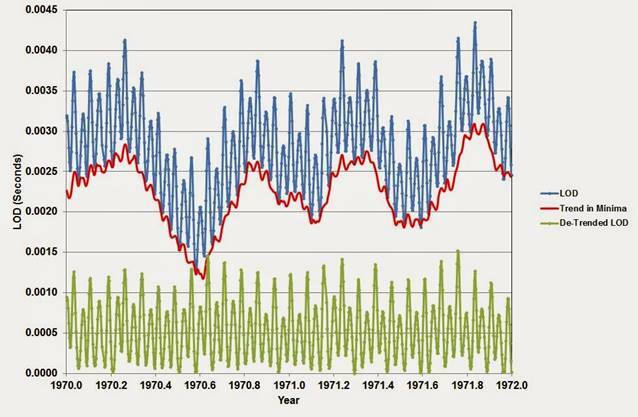 Hence, the model asserts that it is the modulating eﬀects of the planetary tidal-torquing that are primarily responsible for the observed long-term changes in the overall level of solar activity. 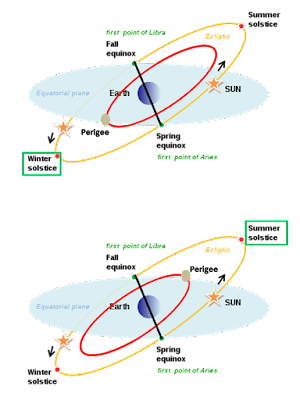 It is important to note that tidal bulges will be induced in the surface layers of the Sun when Venus and the Earth are aligned on the same side of the Sun (inferior conjunction), as well as when Venus and the Earth are aligned on opposite sides of the Sun (superior conjunction). 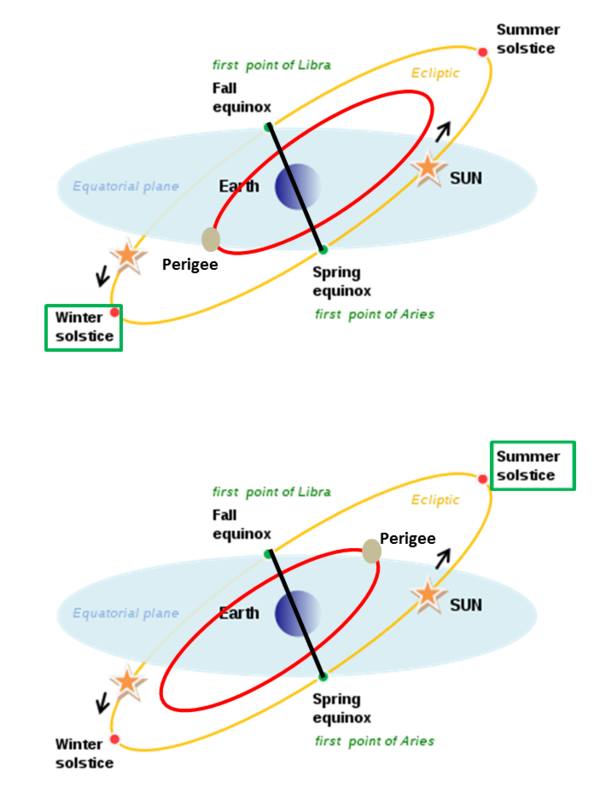 This means that whenever the gravitational force of Jupiter increases/decreases the tangential rotation rate of the surface layer of the Sun at inferior conjunctions of the Earth and Venus, there will be a decrease/increase the tangential rotation rates by almost the same amount at the subsequent superior conjunction. Intuitively, one might expect that the tangential torques of Jupiter at adjacent inferior and superior conjunctions should cancel each other out. However, this is not the case because of a peculiar property of the timing and positions of Venus– Earth alignments. Each inferior conjunction of the Earth and Venus (i.e. VE alignment) is separated from the previous one by the Venus–Earth synodic period (i.e. 1.5987 yr). This means that, on average, the Earth–Venus–Sun line moves by 144.482 degrees in the retrograde direction, once every VE alignment. Hence, the Earth–Venus–Sun line returns to almost the same orientation with respect to the stars after ﬁve VE alignments of almost exactly eight Earth (sidereal) years (actually 7.9933 yr). Thus, the position of the VE alignments trace out a ﬁve pointed star or pentagram once every 7.9933 yr that falls short of completing one full orbit of the Sun with respect to the stars by (360−(360×(7.9933− 7.0000))) = 2.412 degrees (fig. 4). In essence, the relative ﬁxed orbital longitudes of the VE alignments means that, if we add together the tangential torque produced by Jupiter at one superior conjunction, with the tangential torque produced by Jupiter at the subsequent inferior conjunction, the net tangential torque is in a pro-grade/retrograde direction if the torque at the inferior conjunction is greater/less than that of the torque at the superior conjunction. 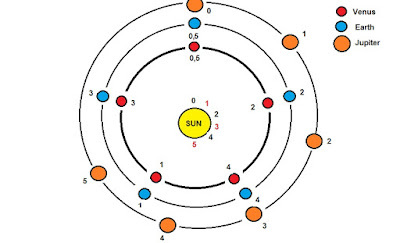 What makes this simple tidal-torquing model so intriguing is the time period over which the Jupiter’s gravitational force speeds up and slows down the rotation rate of the Sun’s outer layers. 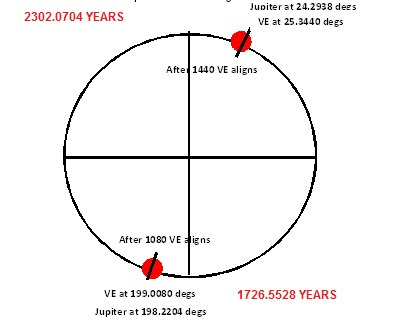 Figure 5 shows Jupiter, Earth and Venus initially aligned on the same side of the Sun (position 0). In this conﬁguration, Jupiter does not apply any tangential torque upon the tidal bulges (the position of the near-side bulge is shown by the black 0 just above the Sun’s surface). Each of the planets, 1.5987 yrs later, moves to their respective position 1's. At this time, Jupiter has moved 13.00 deg. ahead of the far-side tidal bulge (marked by the red 1 just above the Sun’s surface) and the component of its gravitational force that is tangential to the Sun’s surface tugs on the tidal bulges, slightly increasing the rotation rate of the Sun’s outer layers. After a second 1.5987 yrs, each of the planets moves to their respective position 2's. Now, Jupiter has moved 26.00 deg. ahead of the near-side tidal bulge (marked by the black 2 just above the Sun’s surface), increasing Sun’s rotation rate by roughly twice the amount that occurred at the last alignment. This pattern continues with Jupiter getting 13.00 deg. further ahead of the nearest tidal bulge, every 1.5987 yrs. Eventually, Jupiter will get 90 deg. ahead of the closest tidal bulge and it will no longer exert a net torque on these bulges that is tangential to the Sun’s surface and so it will stop increasing the Sun’s rotation rate. Interestingly, Jupiter’s movement of 13.00 deg. per 1.5987 yr with respect to closest tidal bulge means that Jupiter will get 90 deg. 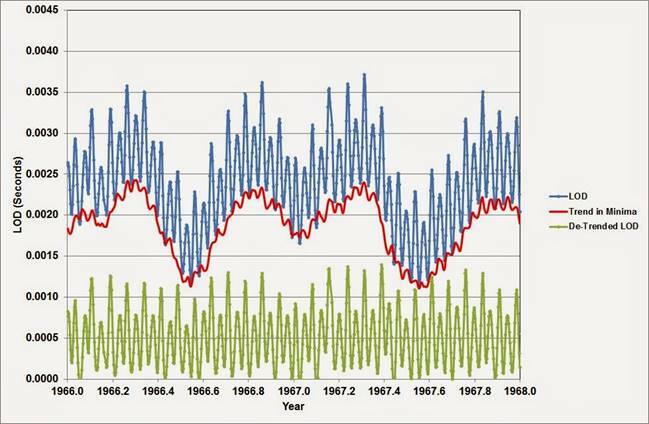 ahead of the closest tidal bulge in 11.07 yrs. This is almost the same amount of time as to average length of the Schwabe sunspot cycle (11.1 ± 1.2 yrs, Wilson, 2011). In addition, for the next 11.07 yrs, Jupiter will start to lag behind the closest tidal bulge by 13.00 deg. every 1.5987 yrs, and so its gravitational force will pull on the tidal bulges in such a way as to slow down the rotation rate of the outer convective layers of the Sun. Hence, the basic unit of change in the Sun’s rotation rate (i.e. an increase followed by a decrease in rotation rate) is 2 × 11.07 = 22.14 yrs. This is essentially equal to the mean length of the Hale magnetic sunspot cycle of the Sun, which is 22.1 ± 2.0 yrs (Wilson, 2011)." Figure 6 shows the position of Jupiter every VE alignment (i.e. 1.59866 years) in reference frame that is rotating with the Earth-Venus-Sun alignment line. 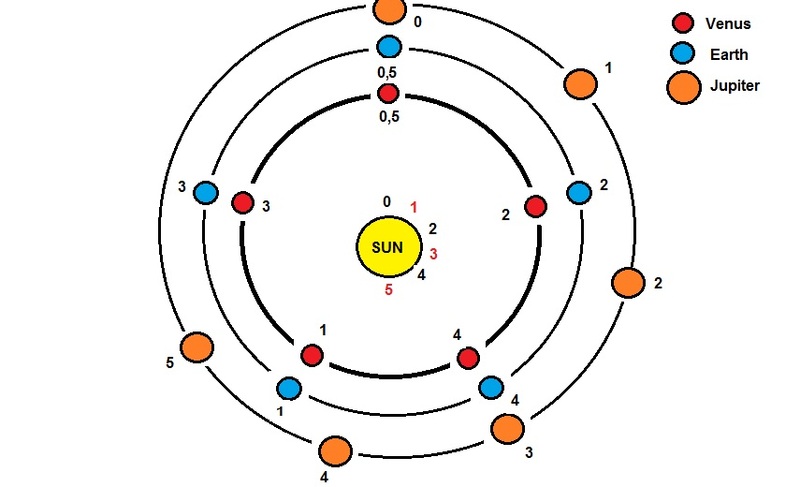 This keeps the Earth and Venus at the 12:00 o'clock position in this diagram whenever the number of VE aligns is even and at the 6:00 o'clock position whenever the number of VE aligns is odd. In contrast, Jupiter starts out at JO and moves 12.9993 degrees every 1.59866 years, taking 11.07 years to move exactly 90 degrees in the clockwise (pro-grade) direction and 11.19 years to the position marked J7 (at roughly 91 degrees). The following table shows how Jupiter advances by one orbit + 3.9796 degrees every 28 VE alignments until the alignment of Jupiter with the Earth-Venus-Sun line progresses forward by 13 orbits in the VE reference frame plus 51.7345 degrees. This angle (see * in table) is almost exactly equal to the angle moved by Jupiter in 4 VE aligns (i.e. 4 x 12.99927 degrees = 51.9971 degrees). Its appearance, however, is intermittent. Careful analysis of the Be10 and C14 ice-core records show that the de Vries cycle is most prominent during epochs that are separated by about 2300 years (Vasiliev and Dergachev, 2002). 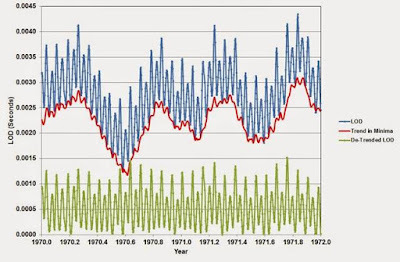 This longer modulation period in the level of solar activity is known as the Hallstatt cycle (Vitinsky et al., 1986; Damon and Sonett, 1991; Vasiliev and Dergachev, 2002). 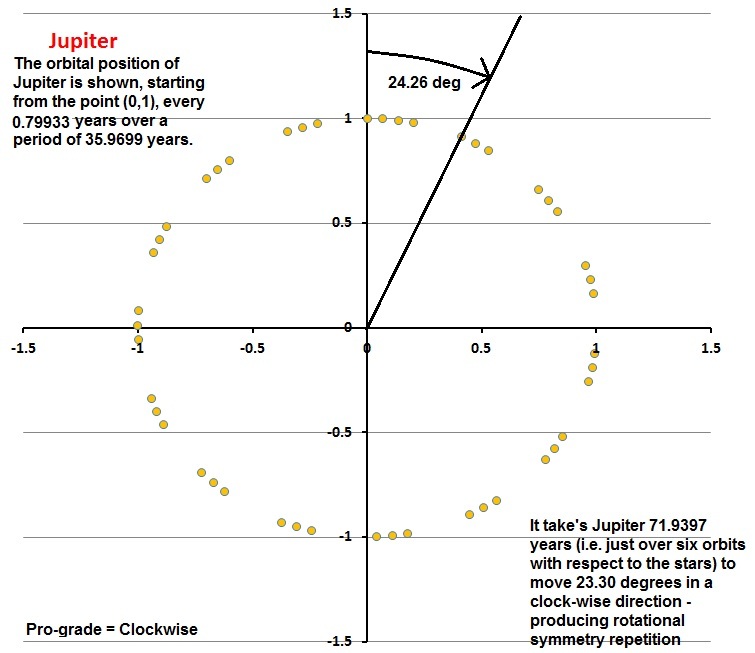 Figure_A1 shows the orbital position of Jupiter, starting at (0,1), every 0.79933 years, over a period of 35.9699 years [i.e. just over three orbits of the Sun]. It is clear from this diagram that, in a reference frame that is fixed with respect to the stars, the symmetry pattern perfectly re-aligns after moves roughly 24.26 degrees in a clockwise (pro-grade) direction. It takes Jupiter 71.9397 years (i.e. just over six orbits of the Sun or 45 VE aligns) to move 23.30 degrees in a clockwise (pro-grade) direction, to approach with one degree of producing a re-alignment of rotational symmetry. Figure_A2 shows the precise alignments Jupiter with the Earth-Venus-Sun line at 575.5176 years (360 VE aligns) and 1151.0352 years (720 VE aligns) in a frame of reference that is fixed with respect to the stars. Jupiter lags behind the VE alignments by 0.2654 degrees and 0.5251 degrees, respectively. Figure_A3 shows the precise alignments of Jupiter with the Earth-Venus-Sun line at 1726.5528 years (1080 VE aligns) and 2302.0704 years (1440 VE aligns) in a frame of reference that is fixed with respect to the stars. Jupiter lags behind the VE alignments by 0.7876 degrees and 1.0502 degrees, respectively. The important point to note is that after four precise Jupiter alignments of 575.5176 years (i.e. 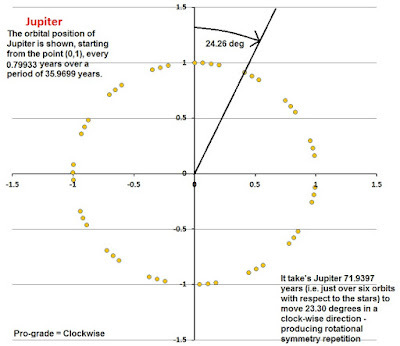 4 x 575.5176 = 2302.07 years), the position of Jupiter advances from its initial position at JO (see figure 6 and figure_A1 above) by 24.2983 degrees. This angle is almost exactly the same as 24.26 degrees of rotation that is required to produce a re-alignment of the rotational symmetry of Jupiter, in the reference frame that is fixed with respect to the stars. 1. 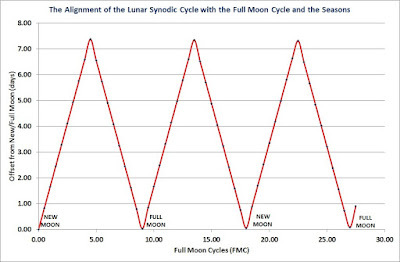 There is a lunar tidal cycle that synchronizes the slow precession of the lunar line-of-apse with the seasons and the Synodic cycle (i.e. the Moon's phases). 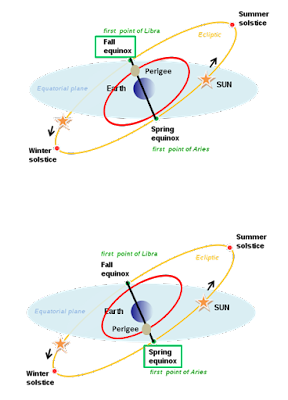 The tidal cycle is called the 31/62 year Perigee-Syzygy Cycle. 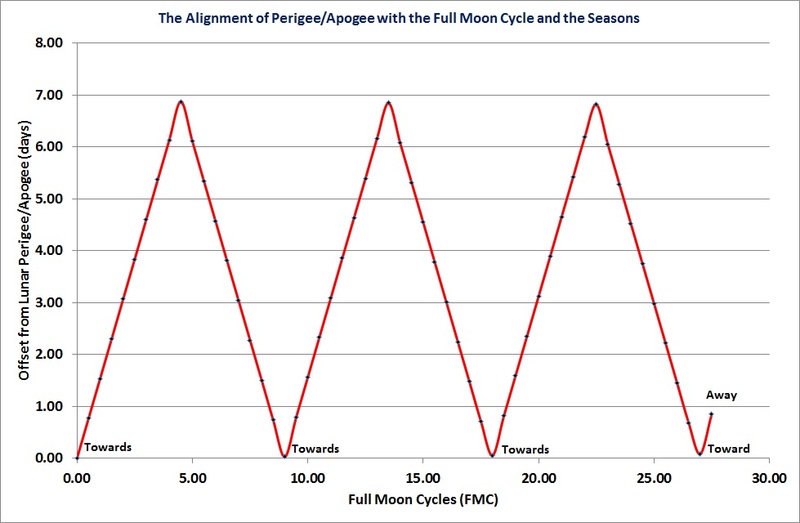 This tidal cycle is the time required for a full (or new moon) at Perigee to re-occur at or very near to the same point in the seasonal calendar. 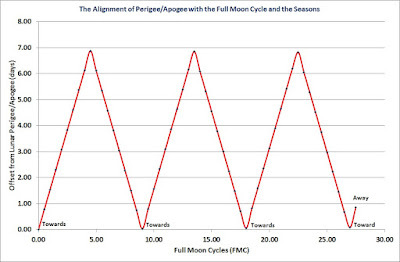 It is highly recommended that readers go to the following link to get a fuller understanding of the parameters that are used to define the lunar orbit as well a better understanding of the 31/62 year Perigee-Syzygy tidal cycle, before proceeding with this post. El Niño events in New Moon epochs preferentially occur near times when the lunar line-of-apse aligns with the Sun at the times of the Solstices.. The Changing Aspect of the Lunar Orbit & its Impact Upon the Earth's Length of Day. The blue curves in figures 1a, 1b, and 1c (below) show the Earth's LOD over a six year period from January 1966 through to December 1971. These plots use daily LOD values that are available online from the International Rotation and Earth Reference System Service (IERS) covering the period from January 1962 until the present. It is evident from these three figures that there are abrupt periodic slow downs in the Earth's rotation rate (corresponding to an increase in LOD ~ 1 msec) once every 13.66 days (blue curve)* that are accompanied by much smoother longer-term changes in LOD that are associated with the annual seasonal cycle (red curves). 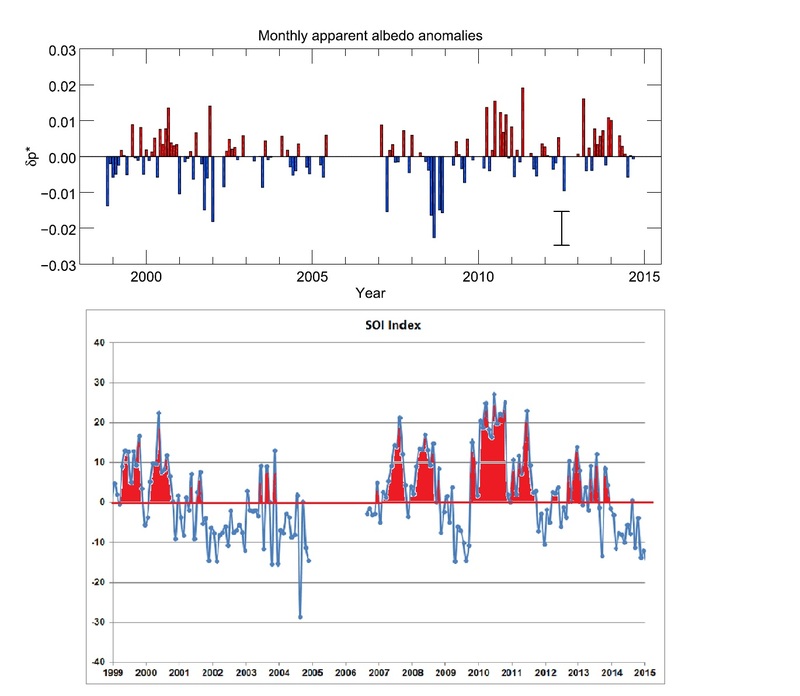 The smoother longer-term seasonal variations in LOD are primarily the result of changes in the angular momentum of the Earth that are a response to the slow (north-south) seasonal movement of the Earth's atmosphere and its wind patterns. The green LOD curve is a crude seasonally de-trended version of the blue LOD curve. within a day or two of the time that the Moon crosses the Earth's Equator. Earth's oceans (and atmosphere) passing across the Earth's Equator. spin by extending their arms i.e. by the conservation of angular momentum. Moon across the Equator from the southern to the northern hemisphere. 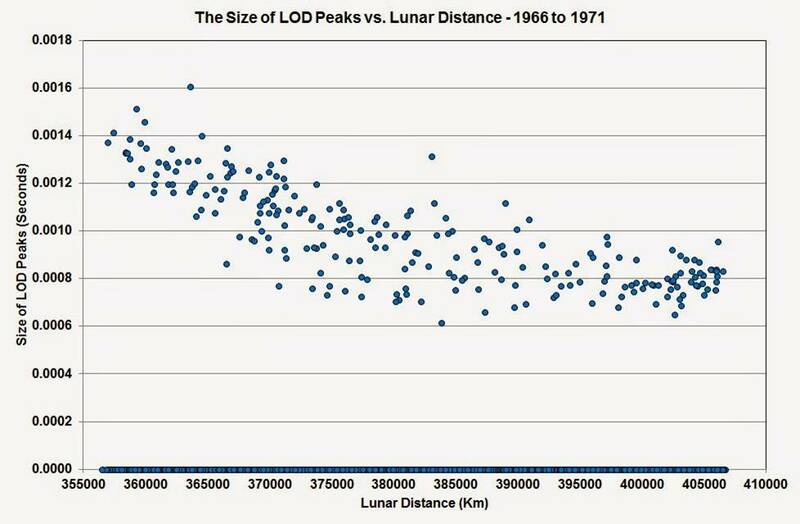 By early 1969 (figure 1b), the consecutive peaks in LOD are almost equal in size. numerator of the ratio, for the years from 1966 to 1971. 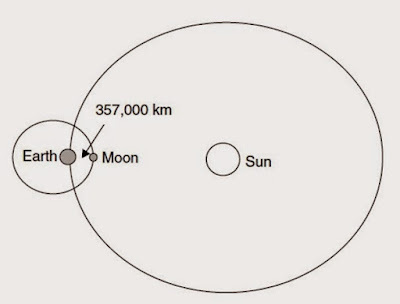 Moon's average distance from the Earth of approximately 380,000 km. (i.e. 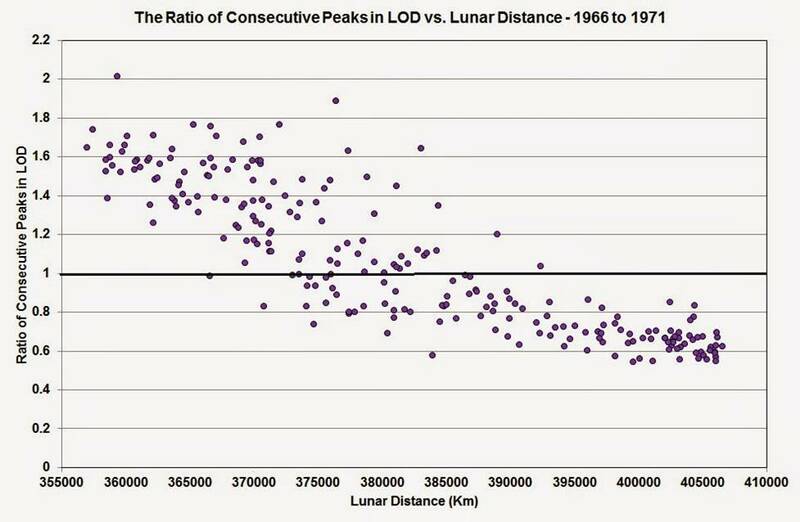 the distance of lunar apogee = 407,000 km). 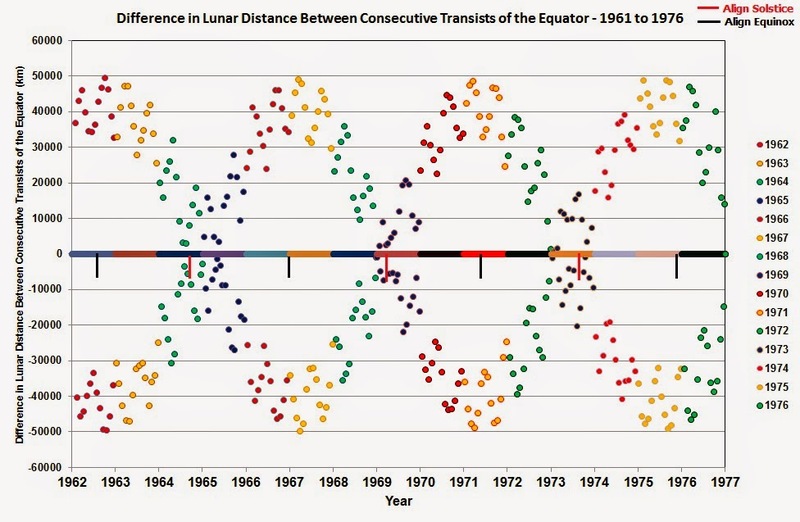 Equator from 1962 to 1976.
distances at consecutive crossings are both close to the average lunar distance of 380,000 km. 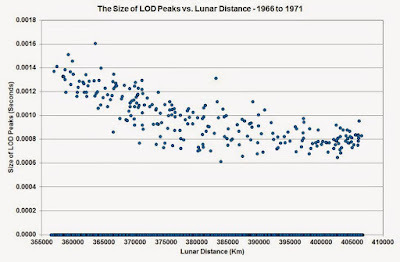 far from 1.0 because the Moon is near perigee and apogee at consecutive crossings. d. Reason for the Change in the Ratio of Consecutive Peaks. six months at the Spring and Autumnal (Fall) equinox, respectively. months at the Spring and Autumnal (Fall) equinox, respectively. orbit crosses the black line. 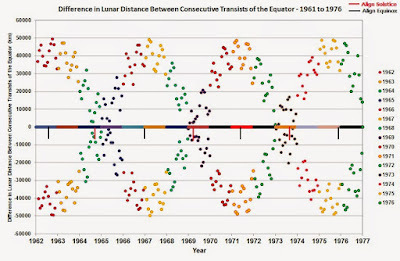 at consecutive transits of the equatorial plane (i.e. where the red orbit crosses the black line). 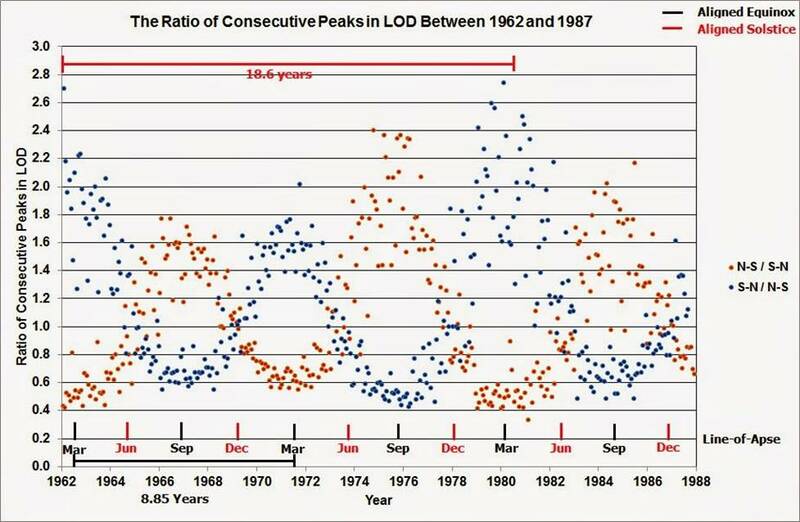 of consecutive peaks in LOD will be as far from 1.0 as possible). 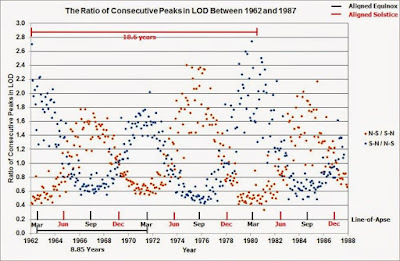 Figure 7 shows the ratio of the consecutive 13.66 day peaks in LOD from 1962 to 1988.
modulates the ~ 9 year periodicity. Sun at a Solstice/Equinox to move to the following Equinox/Solstice in the seasonal calendar. end of this post about the possible long-term interaction of these two lunar cycles). f. A Gleissberg Cycle in the Ratio of Consecutive Peaks in LOD. days = 2.2547695 sidereal years = 2.2548570 topical years. sidereal years and 7.850234 lots of 2.2547695 sidereal year cycles in 17.70046823 sidereal years. Equatorial plane every 13.66 days. Which is half of a Hallstatt-like cycle of 2341.247 tropical years. Hence, the interaction between the LAC with LNC naturally produces a Hallstatt-like cycle. 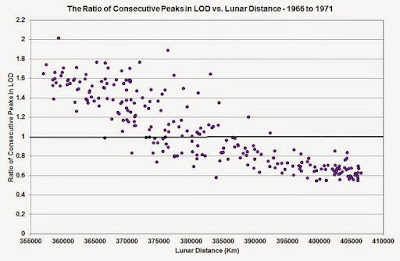 lunar orbit points either towards or away from the Sun - up to 27.5 FMC = 31.00308 sidereal years. with the Moon being less than one day past Full Moon at 27.5 FMC = 31.00308 sidereal years. from the Sun once every 0.5 FMC).